I never thought I’d find myself loving a building site but this one is special. 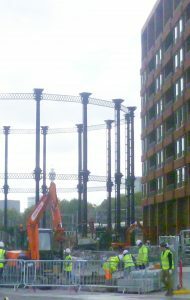 Gasholder, men in hard hats and yellow jackets, machinery, Victorian warehouse: it must be the new Kings’ Cross development! 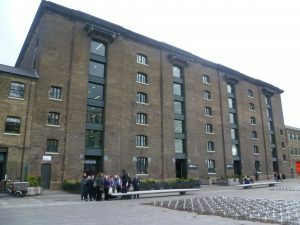 In the 19th century, the area around King’s Cross station was a hive of industry with barges bringing goods from the Port of London up the Regent’s Canal for storage in the huge warehouses there, like the Granary Building which stored grain. But by the 1970s, the area had become a wasteland, full of decrepit empty buildings, and notorious for drugs and prostitution. Not any more. It is being totally transformed and this post is a whistle-stop tour of what’s going on. Grab your hard hats and let me show you round. Usually, redevelopment means the total destruction of whatever was there before and the construction of new buildings built, one feels, to maximize profit and to hell with how it looks and works. This development has a very different feel. Many of the old industrial warehouses have been inventively re-designed for new uses. The modern buildings are unashamedly 21st century but they also respect the historic heritage. The whole place feels friendly and welcoming. 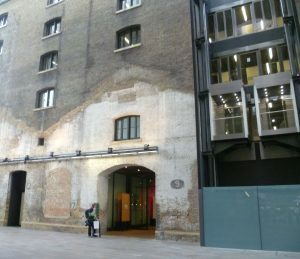 Inside the Granary Building, the architects have deliberately left traces of the old sheds on the wall. You can see where Shed No. 9’s roof once was and the huge space in front of it now has ping-pong tables for the students. Anyone can play for free; you don’t have to book, just turn up. Bats and balls are supplied. The House of Illustration is now a small Art Gallery, currently showcasing two children’s book illustrators: an Edward Ardizzone retrospective, and an exhibition of Quentin Blake’s illustrations for Kitty-in -Boots. Round the corner, I came to Art House Residential, a housing complex, all glass and balconies. 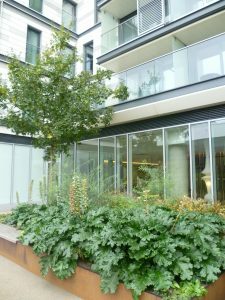 The planting here, and throughout the site, is sustainable and based on wild flowers found in railway sidings; they look after themselves, with the occasional tweak. Railways tunnels run directly underneath, so the garden’s weight is carefully monitored. 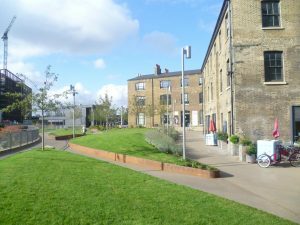 Every train out of King’s Cross has to go under Regent’s Canal, so trees need special planning permission and their roots have to be shallow. 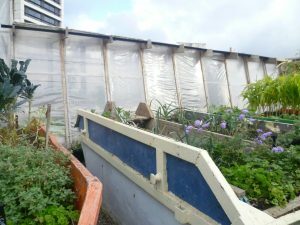 I walked up through Lewis Cubitt Park, noting that the plants are in special raised up beds. Beyond the flats there is a children’s playground and the Skip Garden, full of flowers, planted and maintained by local school children. When the builders want to move in, the skips are simply lifted up and moved to another location. Behind the Skip Garden is a temporary viewing tower. Looking south and west you see how many building projects are going on simultaneously. Look north and you can just spot the Eurostar railway tunnel coming from St Pancras. I managed to get a photo of the Gatwick Express as it shot through. 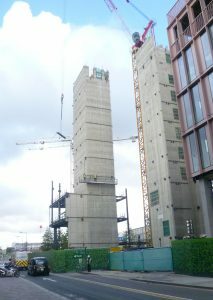 Turning into Handyside Street, parallel to Granary Square, the Educational Centre tower block is flanked by a number of impressively tall cranes moving scaffolding about. The two men perched half way up the outside look like mini Bob the builders. Respect, guys! Turning left – and avoiding the dumper trucks, which are everywhere – you come to Stable Street, once home to dozens of horses who hauled goods from the canal barges to the warehouses. 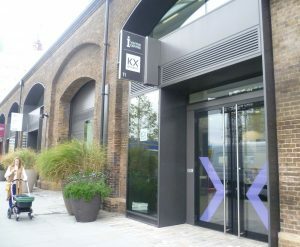 The Visitor Centre here does regular tours of the King’s Cross site. The most astonishing transformation of all is what’s happened to the gasholders, once an impressive sight along Goods Way. They were dismantled carefully, sent to Birmingham to be restored, and then returned to new homes. Gasholder 8 now has a small park inside it. And very impressive it looks with the gasholder itself acting as a sort of Greek peristyle surrounding a saucer-shaped grassy space. 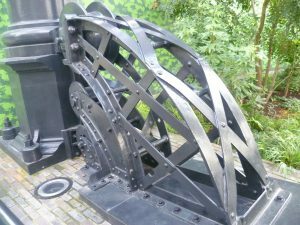 It allows you to look closely at the wonderful details of the original gasholder. 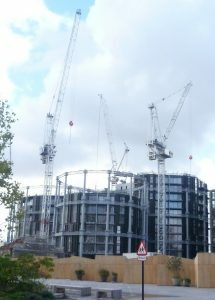 Three of the large gasholders, which are cleverly linked, are having stylish blocks of flats built inside them. The photograph shows the buildings in progress with the enormous cranes towering above them. 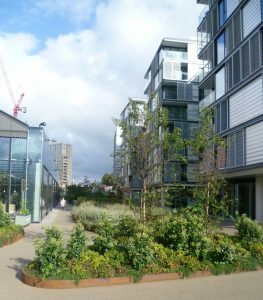 As well as all this, there are restaurants, cafés, bars, an Everyman Cinema, the Platform Theatre, specialist shops, a Waitrose, the Barnes School for Deaf Children. (Next year’s musician in residence will be the drummer, Dame Evelyn Glennie.) There are ten new parks and squares, sports facilities and a library. What’s more, it’s car free. I’ve only managed to touch on a few of the most interesting buildings. It’s a small part of what’s already here; and there’s much more to come. It’s a fabulous area. I was walking around there last weekend. I really SO WANT one of those gasholder apartments! Me too, Jan! I’m hoping that next London Open House weekend they may have one that we can go and see for ourselves. Wow – I had no idea all that was going on. I’d seen some of the cranes of course from a distance, but this is so much more. Thanks for a fascinating post – and I think I’ll be popping over sometime to have a first hand look. As usual, fascinating. Planning my trip up to see the exhibition at the BL, so may include this, too! It’s only a five minute walk from the British Library, Lesley. 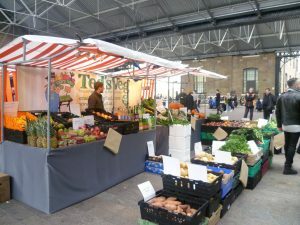 The section I visited was on the north side of Regent’s Canal. 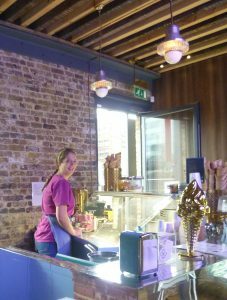 There’s a lot happening on the south side of the canal, just behind King’s Cross station, too – but it doesn’t have the gasholders, nor Ruby and Violet’s ice cream/hot chocolate! I do so agree, Christina. It requires a lot of joined up, long term thinking, though, which is in short supply in these days of making a quick buck. The time and money spent in creating the infrastructure of the entire site, on both sides of the canal, before anything was actually built, was phenomenal. But I think the results are definitely worth it. A really fascinating post, Elizabeth, thank you so much. I shall take a look at this the next time I come to London! I’m delighted you enjoyed it, Melinda. 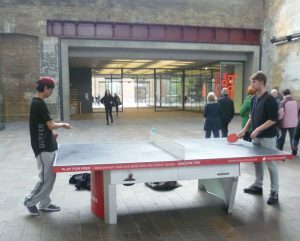 Last week it was a toss up between the King’s Cross exploration or Carcassonne – and King’s Cross will still be there on our doorstep next week. On the strength of your description we will certainly go and explore it very soon. You describe some enticing parts of the site. The re-purposed gas-holders! The House of Illustration – Ardizzione and Quentin Blake, both firm favourites. And I did not know that Ruby Violet did winter treats too. How can one resist? Thank you for this Elizabeth. It wets our appetite for a visit. Thank you for dropping by, Pauline.I can see that a visit to Carcassonne wins! But King’s Cross will interest you, too, I’m sure. Ruby Violet has some scrumptious winter treats.